Against Nature is, like its predecessor, Against Art, barely even veiled as fiction. It begins with the beginning of a love-affair, the forty-eight year-old Tomas hooking up with a much, much younger woman at a New Year's Eve celebration, almost immediately professing his love for her ("It's too early to say that sort of thing", she says). She's hesitant -- "I can't see you again", she says at one point, leery of where this might be leading so fast -- and this opening section, describing only that first encounter, is inconclusive; it is only much later in the novel that the narrator returns to this relationship, and what became of it. All at once he feels acutely tender towards her, holds her, feels her trembling, he runs his hands through he hair, kisses her cheek, as if she's already his girlfriend, his closest and most beloved, it happened so quickly, so unexpectedly and powerfully, he didn't know how much he yearned for her, how much he needed her. In describing that encounter, he turns away from it too and tells of another, a literary parallel, the story of Peter Abélard and his love for the girl less than half his age, sixteen-year-old Héloïse. He resorts to literature to deal with the actual; not surprisingly, too, in the rest of the novel he turns far back and takes considerable time before getting back to this particular passion, and to finally addressing its effect on him more directly. Against Nature describes stations from the author's life. The second section centers on a summer the teen spent working in the factory where his father was a manager, a dirty, awful job. He has a girlfriend, a year younger than him; she is an important figure to him -- "the girl I loved and with whom I wanted to spend the rest of my life" -- but remains peripheral here. In the next section, the flighty, complicated actress Agnete has a more prominent role. Theirs was a tempestuous relationship: they'd (briefly) marry -- more for convenience than any other reason -- and she was the mother of his beloved Amalie; they ventured to Nicaragua together (her idea); she died young. The young girl and the older man. We needed each other. I've written eleven novels. And I've filled more than forty exercise books with notes. I regard them as bona fide books. Forty books of notes, sketches, diary entries, drawings and letters. I have no idea how many pages my otebooks cover; these black-bound volumes in which I give substance to my days. So which work is more important, is it the novels or the notebooks ? I think it's the notebooks. My situation is the worst imaginable; I love her and she isn't there. Haven't written for a week. Haven't washed for a week, I'm completely clean. Getting cleaner and cleaner. Unshaven, dirty, like nature, that's total purity. Writing is part of the process; writing is also a (last) hold in a world that has collapsed around him (and becomes ever more elemental: "it's almost like living in the wild", he finds). We lay side by side and read. We read our separate copies of the Knausgaard books, began at the same time and read in tandem, suddenly she'd put down her book and look at me: Did you read that ? she'd ask. How does he dare, it's quite extraordinary, he must have a screw loose, she'd say. Until I put down my book and looked at her; Did you read that ? I'd ask. How does he dare, it's quite amazing, he's destroying himself, I'd say. 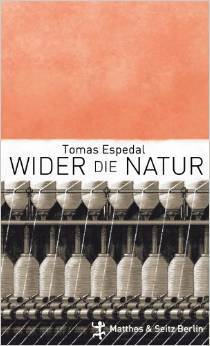 Yet Espedal's novel is similarly revealing and forthright -- if also in many respects more guarded, more cautious (or deliberate) in its presentation. Yet it is also more radical in its creative restructuring of life and events than Knausgaard's word-flood. She'd given birth to both her daughters at home, now she wanted to die in the same way, in her own bed. 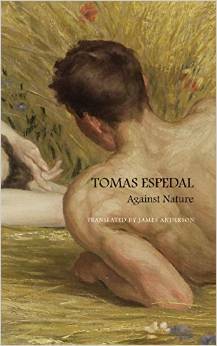 Tomas, on the other hand struggles -- against nature, in all its different manifestations. Writing -- an imposition of some order, an act against nature -- is his hold, and what he ultimately turns to. Much of Against Nature in fact recounts periods when he isn't a writer, whether as sixteen-year-old, learning the lesson that he detests factory-work, or later, living with Agnete, encountering writer's block, or then trying to get over Janne, when he can't seem to get much beyond the occasional scribbled notebook-note. But writing, against nature, is ultimately and repeatedly his salvation, too. 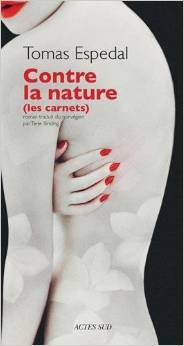 Note: There's no obvious choice for cover-design for Against Nature, and it's not surprising that publishers in different countries went with entirely different looks: here, for example, in turn, the covers of the English-language (Seagull), Danish (Batzer & Co.), French (Actes Sud), and German (Matthes & Seitz) editions. The Seagull one is based Auguste Levêque's Idylle d'été -- but cropped like this maybe doesn't quite suggest enough ? 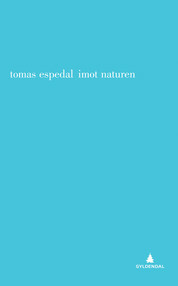 Norwegian author Tomas Espedal was born in 1961.